Roseau Dominica —- Tickets for this year’s Dominica World Creole Music Festival (WCMF) go on sale online and at the DDA’s Office from this Wednesday, 22nd August, 2018, as Dominica and the region get ready for the staging of the 20th Edition of the WCMF from October 26-28, 2018 at Windsor Park Stadium, Roseau, Dominica. Patrons to the festival can purchase tickets online from Wednesday at EC$125/US$46.00 per night or EC325/US$115.00 for season tickets. Additionally, patrons in Dominica wishing to do early purchase of their season tickets can do so at the office of the Discover Dominica Authority at the Financial Centre in Roseau, or at the upcoming WCMF Reunion Hype activities for only EC$250.00. The special priced tickets will only be available for a limited time this year, so patrons are encouraged to do their purchases early. 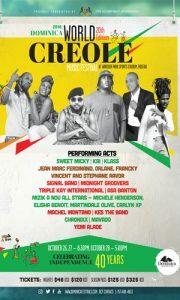 For more information on the 20th Annual World Creole Music Festival, visit www.DominicaFestivals.com. About Dominica’s World Creole Music Festival: Dominica’s World Creole Music Festival celebrates the creole culture of creole speaking countries in the Caribbean, Europe and Africa. The Festival, held annually in October seeks to augment the creole month festivities and Independence celebrations held during this period as well as boost visitor arrivals to the island. The World Creole Music Festival features various musical genres to include reggae, zouk, konpa, cadence, bouyon, salsa, dancehall/hip hop, meringue, soukous, zydeco. The Festival is dubbed ‘Three Nights of Pulsating Rhythms’ for its wide repertoire of musical genres on showcase each night. Join us for the 20th World Creole Music Festival, October 26-28, 2018.